Pictured: 2014 Arkansas River Trash Roundup poster. Cargill is donating $13,125 for this year's event. WICHITA, Kan. – April 7, 2014 – It is “lucky 13” for the Arkansas River in 2014 when the City of Wichita’s Earth Day event brings volunteers together for the 13th annual spring cleaning to remove trash from the waterway through the downtown area, April 26, 2014, 9:00 a.m. to noon. Wichita Ducks Unlimited will benefit from this event, receiving proceeds raised from sponsors to underwrite the Ducks Unlimited Junior Legacy Greenwings educational program for children up to 11 years of age in Sedgwick County. 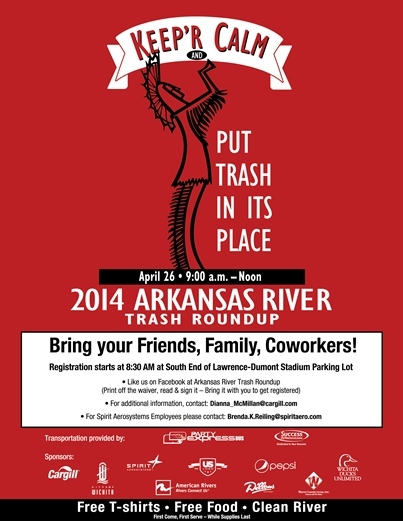 Check-in for the 2014 Arkansas River Trash Roundup will be at the south parking lot of Lawrence Dumont Stadium beginning at 8:30 a.m. Underscoring the day’s environmental theme, the City of Wichita will be providing free auto emissions testing in the Lawrence Dumont Stadium west parking lot from 10 a.m. to 12:20 p.m.
Cargill will be the title sponsor for the sixth consecutive year, in a partnership that includes the City of Wichita, Wichita Ducks Unlimited, Spirit AeroSystems, Dillons Food Stores, Pepsi, Bimbo Bakeries USA, Davis-Moore Chevrolet, U.S. Logo, Inc., Waste Connections, Inc., The Party Express Bus LLC, Success NationaLease, Envision and American Rivers. The trash roundup is Wichita’s primary Earth Day event and one of Cargill’s Earth Day environmental support activities taking place around the world in April, May and June. Volunteers participating in the 2014 Arkansas River Trash Roundup will collect and remove garbage and debris that has accumulated along the banks of the river near downtown Wichita over the past 12 months, as well as in the area extending north and south of the immediate downtown area. Records were set in 2013 when the trash roundup attracted more than 730 volunteers (a new record) that filled 630 bags (a new record) with 2.36 tons of trash and debris from the river and its banks in the downtown area. This year, the Arkansas River Trash Roundup organizing committee challenged high schools in Wichita and surrounding communities to provide volunteers in an effort to help make this Earth Day event one of the premier waterway clean-up efforts in the nation. Cargill is donating $13,125 for this year’s 2014 Arkansas River Trash Roundup. With the Slate Creek wetlands project complete, funds will now support the Wichita Ducks Unlimited Junior Legacy Greenwings program. For a third consecutive year, Spirit AeroSystems is donating $3,000, with both Cargill and Spirit also providing volunteers to organize and participate in the trash roundup. Over the past five years, the annual trash roundup has generated a total of more than $53,000 for Wichita Ducks Unlimited to donate toward the Slate Creek wetlands project. This effort resulted in the wetlands being expanded from 70 acres to more than 900 acres when the project was completed last year. Geographically, the region that includes Wichita is part of the major transnational, intercontinental south central flyway linking the Americas, with many species of migratory and non-migratory birds calling Central Kansas a place to reside, a place to nest or a temporary haven on flights to distant locations stretching from Canada to Latin America.